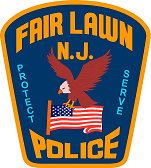 Below is a complete roster of officers that have served the Borough of Fair Lawn since its inception. If you know of any changes, corrections, or additions, please contact Capt. Joseph Dawicki at jdawicki@fairlawnpd.com.